We heartily convey our humble gratitude to the Indian Council for Cultural relations, New Delhi for providing on opportunity to host the Asian Theatre Festival, 2003. And also thankful for bringing together such a diverse group of gifted and groundbreaking National and Asian Theatre professionals, scholars, art activists, producers, etc. in this festival. It will certainly give a chance to witness new piece of work to the art lovers of Manipur to take part in cross-cultural conversations and share in the process that brings dramatic art to life. 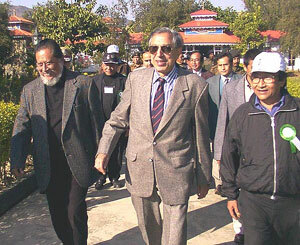 The Governor Ved Marwah and the Director of Chorus Repertory Theatre, Ratan Thiyam at the inauguration of the Asian Theatre Festival, 2003 being organised by Chorus Repertory Theatre in collaboration with the Indian Council of Cultural Relations, New Delhi at Chorus Playhouse, The Shrine. It was mellow Japanese morning what happened on the tragedy. The Synopsis: In Kubi family, many young people were dying, at 20 years of age. Old generations were left behind. This is a story started from Mitsu, a woman in the last Kubi family, She married to Intu family. A mountain dog attacked her. Whole night day she was missing. When she came back she was something suspicious. After 9 month, she was giving a birth. A baby came into this world, boy named Tsukio. But 5 years after Mitsu, mother killed herself. Only Tsukio and grandma were left. The old proverb is running the village, villagers were started a rumour - Tsukio had �the running the God�s blood�. He was so isolated, but he has had an offer of marriage. In the next morning of the wedding, the tragedy. This story was scripted in the northern part of Japan, and added several Asian story. This drama is Story telling by a woman poet. She is like a fortune and past teller. At the end of the story, when she stopped telling we native this a Japanese story but common in all over Asia. Because of the betrayal of her mother by a man, Phuong Nhuoc Minh was born without a father. Phuong Nhuoc Minh, in turn, gave up the love of her life and instead chose to marry a man who could offer her a stable life. But she could not forger her-boyfriend and always regretted her mistake. Moreover, as a leader of her district�s women�s Union, she tried to solve other women�s problems though she could not solve her own. She was living a fake life without even recognizing at herself. The two generations, Nhuoc Minh and her mother always wishes that her children would have real love counted upon Chinese traditional values. God help me . . . . . do not ever bring the tragedy to the third generation. . . . . .Her two-daughter fell in love yet disrupted her wish with Phuong Nhuoc Mint�s own ex-boyfriend who she has secretly been searching for long time in vain. A big hurricane came into their family and took away their serenity and happiness that they had tried to keep for many years. Six other characters that had their own fates and characteristics and never seemed to end enhanced the generation conflict. However it was the second daughter�s feminine kind of loving point of view that easily solved the problem. They finally found out the best way to live together whereby every one of them reached the beauty of women�s typical magnanimity. Nhuoc Minh eventually realized her hypocritical opinions and courageously allowed real love which she had lost to come to her daughter. Ten women in the play by their own motives and dynamics drove away the storm and found the real happiness that they had chosen. Dang Tu Mai was born on October 27th, 1946 at Hanoi, Vietnam. Graduated from Vietnam Fine Arts College (Hanoi) (1964) and got her Master�s degree on Theater Direction from Kiev (Ukraine) film and Theater University (1987) and also in Stage and Film Direction from the same University (1999). Working as leading actress for 18 years in Vietnam National Theatre, she became Director of the company since 1987. Her performances in �Luigi�s Heart� (1985) as second director of the film �End of Misfortune� (1995). She was Co-director of the film �The whisper of the war� (1996) and �After the Death� was still remembered. She got the award of Golden Lotus at the Vietnam National Film Festival (1995) as second director of the film �End of Misfortune� ( 1995). She was Co-director of the film �The whisper of the war� (1996). She also acted in French movie named �Road11� (1997). �Life of Paris�,, an opera was directed by her in 1997. During 1998-1999 she was acting coach of the film �The vertical Rays of the Sun� made by Franco-Vietnamese director Tran Anh Hung. She was co-director of the plays like �The Glass Managerie�, �Light Source in Life� and Playgirl in Maxim�s Restaurant� of the Artists Repertory Theatre. In 2002, she adapted �The gorilla Singer� of the Chinese author Trieu Dieu Dan and �Moonlight in a Small Courtyard� of Chinese author Back Phong Khe (Nov. 2002). Mebuyan Peace Project (MPP), Philippines. PANAW, meaning, journey, is multi media musical theatre performance by women music and theatre artists from Mindanao called the Mebuyan Peace Project. The performance dwells on the themes of life, death, and peace-concerns faced by contemporary Filipino women every day. The story revolves around the Mindanao goddess Mebuyan and how her mythical presence weaves through and affects the lives of three contemporary women: battered wife and overseas worker Rosario, her dead mother Delia who died fighting to protect the scared mountain Malakinay from logging, and tribal priestess Bae Malimlim who brings the two women together. The music-theatre is inspired from the Manobo myth about Mebuyan,the goddess of the underworld who declared to rule over life and death after parting ways with her brother Lumabet who ascended to ruled to the sky. Ten years from the last known research about Mebuyan (1992), the goddess has since transformed into an evil god banished to the depths of the earth for having committed an evil deed. The performance aims to reclaim the existence of the dying goddess. Panaw promotes the concept of life and death as part of along journey. It upholds the idea that living people must resolve their lives in the here, and now lest their souls become restless and full of anguish in Mebuyan�s domain and could get stuck there, unable to journey further to Gimokudan, the soul�s final resting place. At the same time the play nurtures the idea that the journey IS the destination as it tackles the issues of domestic violence, land loss, environmental destruction, and women�s search for empowerment and meaning in their lives. The performance utilizes music, movement, and video showing, with music being the core form. The music is within the �world music� gene, employing various indigenous vocal and instrumental techniques - an orchestra of earthy female voices, acoustic guitars, and indigenous percussion instruments. The dance is inspired from various Asian forms, particularly Mindanaoan - all OF THE EARTH. Rasario is an overseas worker. Battered by a husband who never allowed her to go back home or see her siblings for nine years, she finally returns home to find out her kin have either died or have gone away - nobody knows where. Rosario decides to climb Mt. Malakinay to find comfort and there meets tribal priestes Bae Malimlim who tells her she hears the sounds of the goddess Mebuyan�s laughter and footsteps. She allows Rosario a glimpse of Mebuyan�s domain. In Mebuyan�s domain, Rosario meets the restless soul of her mother Delia. Delia was killed by company guards of a logging company in a protest action against logging in Mt. Malakinay. Before she died, she told her children to run away and look for greener pastures - to escape poverty, and the violence of their everyday life. There was no future in the land, she said. Remorseful for her last words, Delia�s soul roams Mebuyan�s domain in dreary existence while the Goddess of the domain comforts her no end. Delia cannot journey to Gimokudan, her final destination, until her spirit finds peace. Seeing her mother in misery and reflecting on her own personal journeys filled with violence and despair, Rosario finally decides to take full control of her life. MPP is an all-women arts group composed of 16 music and theatre artists and cultural workers coming from Mindanao�s best music and theatre companies: Sining Kambayoka Ensemble, Kaliwat Theatre Collective, Kathara Theatre Collective, Sining Kabpapagariya, Kariala Etniko Music ensemble, Kulturang Atin Foundation. Inc. and seventh Heaven. The organization is a little more than one year old, having been organized in May 2001 although its members each have had 8-20 years experience in music, theatre, and /or cultural development work. MPP is basically a group of consultative nature, working on per project basis with its members more active in their respective mother companies. The members come together occasionally when there are creative projects specifically designed for women and children. Mebuyan Peace Project traces its roots to the very first all-women�s theatre Production in the Philippines in 1993, which involved many MPP members. Entitled �Ova,� the trilogy was produced by the women of Kaliwat Theatre Collective.. From the artistic directors to playwrights to performers to the technical crew, all those involved were women. It was the first attempt by any theatre group in the country at an all-women production. The project�s purpose was to assert women�s capabilities and strength in theatre work and to tell women�s stories from the perspective of women. In 1995, the women of Kaliwat gave birth to Malitan Project, the women�s desk in the organization headed by Ma. Cecilia �Geejay� Arriola. Malitan Project organized the Women Circle involving all the artists involved in �Ova� and some 15 other women development workers. The Women Circle was a loose organization of women artist�s arid development workers who wanted to engage in crreative pursuits. The Women Circle held several activities among which was a bi-monthly Weaving meet where the women would share artistic talents, personal stories, dances, poems, and food. The Circle also conducted several gender awareness workshops, women�s cultural action workshops, dance and art workshops. The one-year project culminated in the Women�s Work and Wisdom Concert held on March 8, 1996 to celebrate International Women�s Work and Wisdom Concert held on March 8, 1996 to celebrate International Women�s Day (IWD). It was huge success. After the project ended in 1996 and the women�s desk of Kaliwat folded up because of lack of funding and personnel, the Women Circle continued to meet informally. In 1997, many members of the Women Circle gathered their energies once more to celebrate IWD. The local government sponsored the two-day dance, drama and song concert. When war broke out in Mindanao in early 2000, many of the members of the Women Circle became actively involved in peace and healing work using, primarily, artistic expressions in stress-debriefing and psycho-social therapy workshops for mostly children refugees in Maguindanao and Cotabato. All these past wonderful initiatives and the continued cry for peace in Mindanao were a source of renewed inspiration for several members of the women Circle to seriously consider organizing themselves into a more formal formation. Thus May 19,2001 the Women Circle was reborn in another name: Mebuyan Peace Project, Inc., to emphasize its renewed vision for PEACE. The essence of Mebuyan Peace Project is Peacemaking through the Art. MA. CECILIAB. ARRIOLA (GEEJAY), Conceptualist, Librettist/Playwright, Music Composer, Artistic Director, Performer; is one of the founding members of Kaliwat Theatre Collective and was a full-time artistrainer-organizer-researcher (ATOR) with Kaliwat from 1988-1995. She wrote music for Kaliwat�s many theatre productions, where she was also frequently a lead performer. Geejay also set up the women's program of Kaliwat Theatre Collective in 1995. She has co-written and co-directed two short women�s plays (1990, 1996), performed a solo dance and music concert in Taiwan (1996), and participated in Theatreworks� Flying Circus Project (2000) in Singapore. She perfomed in �Seven Rituals of Mother Earth� as part of the National Performing Team of Asian Council for Peoples Culture - Theatre for the Environment Network (ACPC - Tent), a landmark Philippine play involving several indigenous artists. Geejay has performed in Taiwan, Japan, Australia, United Kingdom, Ireland, Belgium, and the Netherlands. 1977: Ajitesh Bandyopadhyay left the organization, which he had founded himself - Nandikar - in a huff, perhaps to prove its strength - decided to stage The Caucasian Chalk Circle. Thanks to the massive production of Football, we had an ensemble of 55! We just didn�t have an actress to tackle Grusha/Lutfunneasa. That�s when Swatilekha joined Nandikar. Swatilekha had, under her belt, a double first class in English Literature, she was at home both in Indian and Western Music (be it Piano or Violin or Flute! ), she knew how to dabble with paints and she possessed a natural gift to blend in her acting virtuosity, creative joy and humanism. But, having hailed from small town �Alloahabad, Swatilekha was an �outsider� in Calcutta. What with the snobbery of some �philistine� guardians, and what with her own inability to find clues to the labyrinth of Calcutta Culture, Swatilekha remained for long an �alien� Only a handful of friends and exceptions like Sombhu Mitra, Satyajit Ray, Subhas Mukhopadhyay warmed up to her. More than once, Swatilekha has been invited - to act, direct and for cultural interaction - to England, Germany, France, the US & the USSR. Calcutta - the cultural capital of this nation-has recognized her talents (Best Actress Award/Best Musician Award and so on) rather late in the day. Only the other evening, having witnessed Swatilekha�s versatile performance in Nagar Keeratan, and noted educationist friend gushed: Swatilekha inspires reverential awe! �Better late than never! As the eldest in Nandikar, - I have often regretted that perhaps I have failed to bring out the best in her. Willy Russell�s Shirley Valentine is a great play. Perhaps Swatilekha would measure up to its humaneness and its histrionic challenges. Hence, the re-creation of Shanu Roychowdhury. The Production-process of Shanu Roychowdhury has been variously significant. Collective efforts of �Insider� of Nandikar have been complemented by friends from �Outside�. And the juniors were privileged to learn from their interactive process! This production-process of Shanu Roychowdhury has been variously significant. Collective efforts of �Insider� of Nandikar have been complemented by friends from �Outside�. And the juniors were privileged to learn from their interactive process! This production-process has been traumatic, to say the least. We exchanged opinions, roughed up and sometimes even lacerated each other: In short, we dared the dangers of democracy! This interaction happened with friends like Jai Goswami, Jamil Ahmed and many others. In this celebration we failed to bring in many whether they have missed something or not is for them to judge. We certainly feel deprived. Did someone say brevity is the soul of wit! The walls around me: How long have I talked to you - only you! My husband, son, daughter, even my neighbours - all have been walls. I hate the joke of it! But then, you alone knew how I dreaded the life beyond the four walls. As a child, jumping from the high walls was just just a child�s play to me. What has happened since? Slowly, inexorably, Shanu Roychowdhary was buried in the shadows of the 42 years old Mrs. Shanu Mazumdar. You asked: How are you?� Shanu Mazumdar responded : I am OK� OK, for the vegetables are fresh. OK, for we are all keeping well. OK, for the children are physically intact. Thus we merrily carry on. And, then, before we can discover ourselves, we cease to exist, crushed by unspent every and unrealised dreams. I was wife. I was mother. Once again, I�m Shanu Roychowdhary. Can�t I talk you to sit beside me by this lake, overseeing mountains, and sip with me - though not officially - some Pepsi? I was, I must confess, a long, hard, often painful journey right though the formative phases of shanu Roychowdhury. Often I felt greatly elated : this was one play that would be mine, entirely mine ! But i was apprehensive, too, deeply so: I would have to bear the cross all by my self- whether on stage or in rehearsals ! Suggestions from friends would hurt my pride. If, on the country, they stood aloof, I would feel like a forlorn child. Conflicting as such pulls are, they have their rewards as well. One precious lesson I have learnt : Not in isolation, but, only in communion, you discover you true self. Rudrababu has often remonstrated. Gautam has often matched my �moods�, but has always come back to offer me a true creativ einspiration. And, for months together Debshankar, Sanchayan, along with other students of mine, have acted as true guardians, doling our indulgence and admonition in equal measure, making me feel like a queen! Finally, in a pool of dazzling light, Shanu roychowdhury will cry, laugh, stumble, romp around and try to transcend her gravitational pulls. But deep inside, while performing all by myself, i shall happily know that my friends from far and near are all keeping me company! Chorus Repertory Theatre, Imphal, India. Saint poet Jaideva writing about Mahakavi Kalidasa says, �Poetry was a child of Valmiki who was groomed and nurtured and brought to the enlightened world along with embellishments of numerous forms and hues of Leelas by Bhagwan Ved Vyasa. That damsel of muse (Kavita Kanya) with glittering ornamentations and adornments of Vidharaba tradition, on her own accord, accepted Kalidasa as her bridegroom�. Sixth century poet Kalidasa�s gems of his poetic genius in Sanskrit literature that have been acknowledged world over and presented on stage in numerous translations include works like Abhignan Shakuntalam, Malavikagnimitram, Meghdootam, Ritusamharam, Kumarsambhav, Vikramaorvashiyam, etc, etc. Based on �Ritusamharam� by Kalidasa, this play is a description of Indian cycle of seasons, portraying the close interaction of life and natuer. Kalidasa writes about the six seasons: Grishma, Varsha, Sharad, Hemanta, Shishir, Vasanta in Graphic details. It narrates, in impeccable detail, the impact of seasons not only on the human psyche, animals� and birds� behaviour but also on other animate or inanimate things like insects, flora and fauna. His poetic images are insightful, graphic and powerful. A narrative poem by birth, �Ritu� is not a play in the conventional sense. Kalidasa describes six seasons in as many episodes and they are being presented in visual interpretation as it is . Each episode is complete in itself. There is no tangible story line and there is no effort to create one. The performances try to underline the fact that all human energy is derived from the nature. Now that man is isolating himself and moving away from nature, he is loosing that power and energy that he derived from the beautiful nature. It is a simple expression, through his own vocabulary, of a director who lives in a contemporary world. It is that simple. Chorus (Female) Susha,Nganbi,rasheshori,Leimatombi,Sanjuria, Dhakeshwori, Sujata, Anandi. 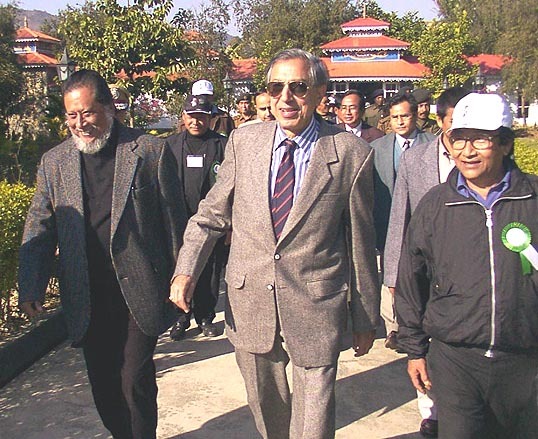 Consultants Ojha Lakpati, Ojha Shyamchand, Ojha Chaobhal, Ojha Ibochaoba, Ojha Ibohal. Ojha P. Gandha, Ojha Khomei, Amusana Devi. The Chorus Repertory Theatre was established in the valley of small hill state, Manipur that is surrounded by the great nine-folds of mountains guarded by mighty tribes on the top in the easternmost part of India in April 1976. Located on the outskirts of Imphal, Manipur�s capital city, Chorus repertory theatre�s two-acre campus has been slowly built (and six times rebuilt after disastrous monsoons) to accommodate a self-sufficient way of life, with housing and working quarters for the company. It is now an important regional and national center for contemporary theatre. This year, its 25th anniversary season, the company dedicates its first permanent theatre called � The Shrine�, a 200 - set auditorium designed by Ratan Thiyam with space for set construction and storage. Thiyam�s 1984 Chakrayvuha, performed more than 100 times around the globe, thrust the company into the global spotlight. With Uttarpriyadarshi, equally acclaimed as a masterpiece, Thiyam continued his examination of the human condition, expanding his explorations of war and power to embrace the search for enlightenment, reconciliation and peace. The repertory has also performed with great success in various places and cities including - London, Delphi, Kalamata, Thessaloniki, Kavala, Athens, Yaroslow, Leningrad, Minsk, Barisova, Southampton, Omag, Amsterdam, Gaisnborough, Bradford, Querentaro, Guanajuato, Cruz-AZul, Guaquil, Quito, Havana, Manizales, Cuba Bogata, Lima, Thimpu, Haa, Bangkok, Chiang Mai, Wellingthon, Zurich, Kathmandu, Tokyo, Tohga, Toyama, etc. Conceived and designed by Ratan Thiyam, �The Shrine� Playhouse is a result of our dedication towards the development of theatre constantly trying to find a place of performance of our own and built from the small savings that was made from the performances of our plays in the last twenty-five yers. The most important aspect of this playhouse is the �Labour of love� or �Shramdaan� contributed by the artistes of the Chorus Repertory Theatre which makes eighty percent of the entire work including earth work, iron work, mason work, woood work, landscaping, gardening etc. etc. was brought with collective thingking and determination to see our dream comes true. Though the entire complex of Chorus Repertory Theatre was swept away several times during floods, the courage to face it and restructure the whole area again and again by its own artistes itself is an example of firm determination seldom to be found anywhere. The aim behind this tiredless effort by the members of Chorus Repertory Theatre is also an attempt to make assessment of our work taking up theatre as profession. 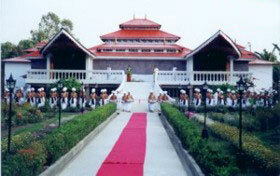 The entire playhouse and complex including massive garden and long Exhibition corridor from the entrance stands at 1.75 acres of land with Langol hills at the backdrop is now a major landmark of Art and Culture in the North East region. The Auditorium and size of the stage is of International standard with sufficient back stage for any International performances.